NOVUS ORDO SECLORUM | Watchman - Declare What You See! After looking once again at the thirteen steps on each side of the pyramid pictured below and in the previous article, I realized that the twelfth step on each side of the pyramid encompasses the years Reagan was elected and then served as President of the U. S. The (12) katuns and (12) 20 year periods of time form another 1212 right on the symbol of the Illuminati! 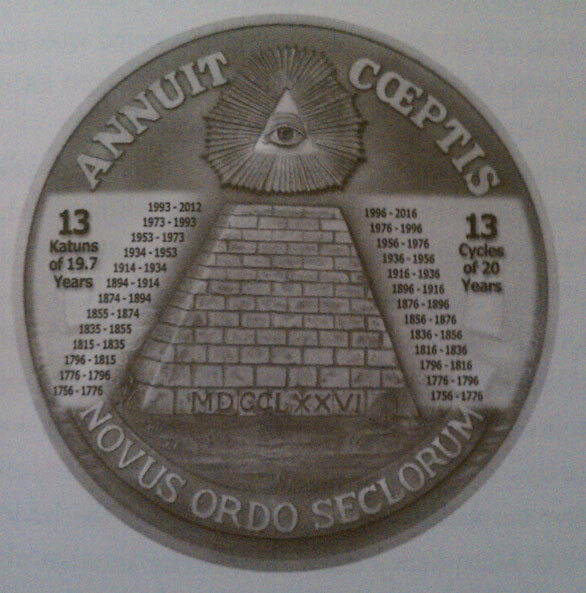 For more information about this pyramid, katuns, Mayan Calender, etc., please read Tom Horn’s, Apollyon Rising 2012, or review previously posted video of Tom Horn the subject. Steve Quayle announced on The Edge with host, John Stokes, that this would be his final broadcast on radio either as a host or as a guest! The link to John Stokes and The Edge can be found at the link below along with Steve Quayle’s message. While the audio can be listened to and paused if need be, you might find the YouTube version easier to leave and come back to since its broken down into several segments. Whichever you choose, it will be time well spent if you’re serious about the things to come upon humanity in the near future! You’ll need to scroll down the page to the January 21st show if you listen on The Edge website. Since the number, 1110, has been discussed in much detail in this series of articles, I will not go into all the ramifications of it once again. If you have forgotten the things associated with this number, please review my previous articles to refresh your memory. Has the Lord given us wisdom in order to understand the “signs of the time” in which we now live? That is, to understand what Lucifer and his followers have in store? Consider the following in relation to the New World Order that is rapidly approaching. We have also looked in-depth about the meaning of the number nine (9) as the number associated with PERFECTION (666) in the Occult/Illuminati/Luciferian belief system. In light of all this, the following gematria appears to make some additional statements about the number nine. Now that we’ve looked at the “False Messiah”, let’s look at the REAL MESSIAH. Twelve is the number associated with Divine Government in Scripture. Satan has a counterfeit for almost everything God does, and we have had a “counterfeit messiah” on the world scene for several months now, and he’s hot on the campaign trail for 2012! Even some of the news media, in the beginning days, were referring to him as a “messiah”, while some even boldly stated that he is “The One“! Much has been posted about all this in previous articles including the scene at the Denver Broncos Stadium, the white horse, and other eye-opening information revealed in the video by Dr. J. R. Church. Reagan’s campaign slogan was, A New Beginning, but here’s the last infamous campaign slogan by a candidate for U. S. President most everyone will surely recognize. Is something occurring in the supernatural realm that millions are not seeing? You better believe it! OK, Jeane, I love you but I have no idea what all those numbers mean. Call me a dummy if you must and I will not take offense. The only number relevent in the Holy Bible that we must watch for is 666. God bless you for having discernment in numbers. I read somewhere that the new world order will need a need a new world religion. Jeane, think about it, the antichrist will rise from the city of seven hills to proclaim the new world order religion. As Watchman33 talks about Reagans rise from the dead, so will this dead pope rise to amaze the world in the end times. Let’s pray for discernment. God Bless. Well, I can’t support nor discredit your statement regarding Chuch Baldwin and his name adding to 666, since I have very limited information about the man, his mission, or his goals. From all appearances, Chuck Baldwin looks to be a “strong patriot” and a “man of God” – which in and of itself could be considered an oxymoron. It certainly takes more than someone’s name adding to 666 to be of any “spiritual significance”! However, since there appears to be some disagreement among people over the “Sumerian Code”, what it represents in relationship to the Last Days and other Biblicial and non-Biblical meanings, I will address this issue from my perspective in the next article posted. Then all readers can make their own determination as to its relevance, meaning, and usage in our day. I fear that the Christian patriot has often gotten side-tracked why we are here, to seek and help the lost be saved. I believe in protecting our family, but Jesus did not say die for the Constitution or to restore “righteous” government here in the United States. Somehow the Dominionist Christians, the patriotic Christians tend to make it sound like that is the most important thing we can do. It is a delicate balance. However, we are told to pray for our leaders, and maybe if we (I include myself) had been doing more of that we would not be going through the coming horrors that are about to fall on us at this time. Some big names, like the above, make it sound like the Founding Fathers were mostly Christian, with the Judeo Christian belief system. It keeps getting over-looked by so many that they had to set up a govenment (which has been a blessing to so many of us for a couple hundred years) with a time table, so it had to be set up to last a long time and fulfill their occultic purposes. I have been torn for years, as my dad was a real patriot, and a courrior for the gov’t during WWII. However, as a born-again Christian, my loyalty is to my Lord, not a human leader or a system. It is hard for anyone who tries to make sense of it all. Above all, the patriot and the Dominionist can still be our bretheren. We must pray for discernment and for generous wisdom He will give to all who ask. Man, I know I for one surely need it. A lot of these well-meaning Christian folks are not well versed in the occult, and are gullible to people who hide the truth, though claiming they are salved. There is a great deal of ignorance in the Conservative Christian camp about the occult, and its wide reach. Many feel it is wrong to even learn about it, or discuss it…thus, they are blind to the best weapon the enemy has against us in all it subtleties. We must all seek Him, and His plan for our lives. Remember when Jesus told the ancient Hebrews when they “see these things”, they were to run for the hills, and not stop to take anything with them….that includes guns and other weaponry. Take care everyone, and be safe. Call on the only one Who can save you and your family through the coming perilous times.